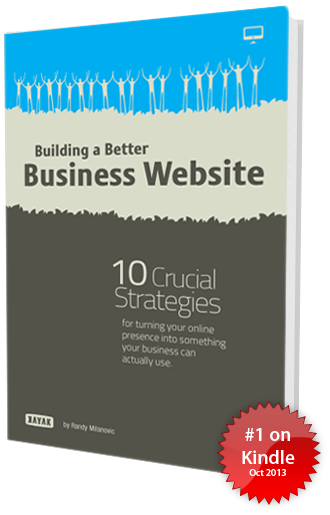 10 crucial strategies for improving your business website. Learn how you can generate leads online with these 10 crucial strategies. Available in paperback, e-book, and as a subscription featuring bonus content. Available in 12 languages for Kindle devices and apps. Available in English language at this time. 10 Crucial Strategies For Turning Your Online Presence Into Something Your Business Can Actually Use. Is your business website really built to generate leads... or is it just an expensive, online version of your company's brochure? The difference isn't just clear and important, it's what separates the companies with successful online marketing efforts from all the others. In this e-book, entrepreneur and lead generation expert Randy Milanovic will share his top 10 ingredients for high-ROI business websites, and how his company, KAYAK Online Marketing, has used them to produce triple-digit percentage increases in sales opportunities in just a few months. How lead-generating websites are arranged (and why they usually don't require expensive website design or custom programming). Why knowing your customers is the first step toward giving them what they want, and how to get the detailed information you need. What smart companies do to turn search engine traffic and social media followers into potential customers. How you can deal with huge increases in leads without spending endless hours at the office or paying more in overhead costs. Quick Link to Building a Better Business Website on Amazon Kindle eBook. English language Paperback also available.